The web hosting industry has seen many companies come and go, but many are still competing for a piece of the action. JaguarPC has been around since 1998 and they’ve been known for their VPS hosting services, which they’ve been offering for quite some time now. VPS hosting services offered by JaguarPC include free management, which beats many of the leading hosting companies in the business. You have the option of choose from a Linux or Windows VPS, with a number of add-ons. They have nearly fourteen years of experience in the hosting business and continue to provide an exceptional service for all their products. JaguarPC offers Linux VPS plans starting at the low price of nineteen dollars a month. With the Plus plan, you receive 25GB space, 3TB bandwidth and 512MB RAM. For most websites that only need the space and data transfer, this would be an ideal VPS hosting solution. The Pro plan from JaguarPC gives you 50GB space, 3000GB bandwidth and 1024MB RAM. Enterprise level VPS hosting plans give you 150GB storage, 5TB of data transfer and 3GB memory. For additional VPS add-ons you can purchase 1000GB of bandwidth for $20/month and additional 512MB RAM installations at $10 each. If you would like to hire a server admin, JaguarPC provides one of theirs at $70/hour. Reliability is a crucial aspect of web hosting, regardless of what type of hosting service you may have. 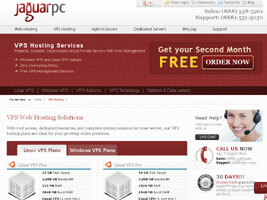 At JaguarPC, all the VPS hosting plans run on the most robust solutions such as SolusVM and Virtuozzo. Along with regular VPS hosting features, you will receive additional security and reliability services such as secure high performance core, brute force blacklisting and cluster authentication. JaguarPC offers 99.9% uptime guarantee with their VPS plans. The medial downtime is due to such things as reboots, hardware replacements and maintenance. With centralized backups, your data remains safe at an offsite location, giving you better security over your website content. JaguarPC gives you a number of ways to get in touch with them, such as live chat, toll free numbers and email. There are two toll free numbers that give you direct lines to the JaguarPC technical support center as well as the sales center. Live chat from JaguarPC is quite efficient as well, as our test run only took thirty seconds for a respondent to attend to us. To get the most recent updates regarding server upgrades and maintenance, you should follow the JaguarPC twitter line, as it keeps you informed. In terms of overall value for JaguarPC VPS hosting services, Windows VPS plans are slightly more expensive. For Linux based plans, prices range from $19 a month to $69 a month. For most stable websites that don’t need a lot of server resource, the Linux VPS Plus plan would be sufficient at nineteen dollars a month. The same plan on the Windows platform would cost you twenty-nine dollars, with complete management of the server. All JaguarPC VPS plans have free management services, so that is something you should consider when buying. For peace of mind VPS hosting, you should always look for a managed hosting solution.